A few weeks ago I was chatting to my fabulous assistant, Caroline about a sale I was planning for Soupstones, my done-for-you meal planning service. Caroline knows each meal plan inside out because part of her job is to create the downloadable PDFs that are sent out each week from the meal plans I write on the website. She mentioned that this year she’s been using the meal plans on a regular basis. I was curious to know how she was finding them so asked if she’d mind me interviewing her about her experience. When you use Soupstones Meal Plans how are things different for you? Caroline: I love that I don’t have to prepare a shopping list and decide what we’re eating the weeks I use Soupstones. I use them when I’m in a rush and don’t have time to prepare a meal plan and shopping list before doing my groceries. Phil: It makes it easy to know what I’m preparing for dinner on the nights I cook. I know how long it’s going to take which makes organizing my evening with the kids much easier. 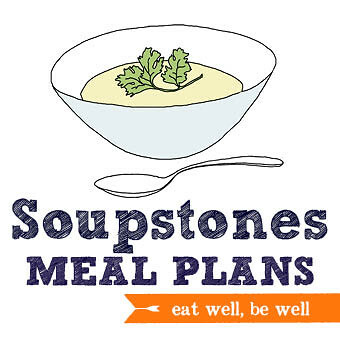 What specific features of Soupstones Meal Plans do you like best? Caroline: I like the variation. When I prepare my own meal plan I tend to cook things I know the kids will eat. When we use Soupstones plans it can be hit or miss with the kids but Phil and I enjoy trying something different. And of course the shopping list. I simply like the fact I don’t have to decide what is for dinner. I also like that we get a bit more variation when we do the meal plans. Would you recommend Soupstones Meal Plans? Caroline: I have recommended Soupstones and have had a few friends try them when you offer a discount. I find that they aren’t great for families with small kids if the kids are fussy and will not eat many of the meals. I don’t use the meal plans as they arrive week to week but choose particular plans that will work with the kids. Phil: I do recommend it but usually only to singles or couples (not to families for the same reason as Caroline). In conversation when someone tells me it’s to hard to prepare meals for one or two people, I tell them about Soupstones where the meals are almost always for two. Caroline: When I do use the plan I sometimes wish it was for 6 dinners and not 5 so that I didn’t have to work out the extra meal or two. I think the layout is great and I love that I can find the plan on my phone if I need to get something and don’t have the list with me. We don’t often make the sweet treat. Phil: Sometimes the portions aren’t enough. I’m a meat lover so we always add the carnivore option to the vegetarian meals. I’m having a quick 50% OFF Easter Sale. The sale ends in less than 48-hours. UPDATE: The sale is now over. This was inspired by farmer and fellow veggie lover Andrea from the Dishing Up the Dirt. I really love one tray dinners like this. Just pop everything in the oven, set your timer, make the sauce and you’re good to go. 1. Preheat your oven to 250C (480F). 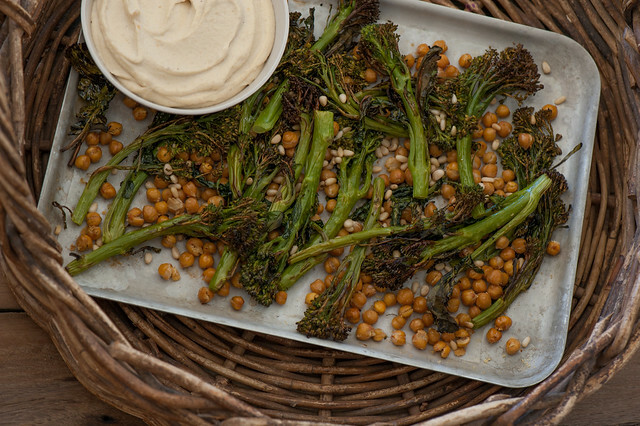 Place chickpeas and broccolini on a baking tray. Drizzle generously with oil and pop in the oven for 20-25 minutes. 2. While the chickpeas and broccolini are cooking, cover cashews with boiling water and stand for a few minutes. 3. Drain cashews and place in your food processor or blender. Add 1/2 cup water, lots of salt and 4 tablespoons lemon juice. Whizz until you have a smooth creamy sauce, scraping the sides down a few times. Give it at least 5 minutes. Gradually drizzle in 4 tablespoons extra virgin olive oil with the motor running. Taste and season with more salt and lemon, if needed. 4. When the broccolini stems are tender and the edges nice and crispy, sprinkle over pine nuts (if using) and pop back in the oven for a minute or so. 5. Serve your roast with cashew sauce on the side and a little extra lemon juice squeezed over. family-friendly – chop a sweet potato into chip pieces and roast in the oven for 10 minutes before adding the chickpeas and broccolini. Soak a handful of raisins in boiling water, drain and toss in at the end. carnivore – serve as a side for grilled or pan fried chicken, fish or pork chops. We had it with chicken kebabs the other night and it was lovely. Or slice some chorizo or other spicy sausage and add with the chickpeas. 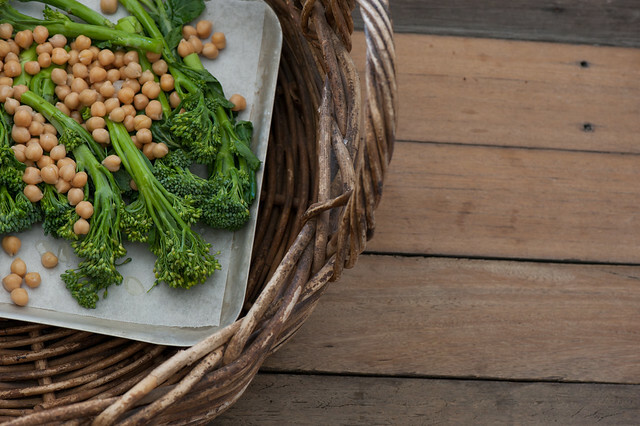 more substantial / carb-lovers – add chopped root veg to roast for 10 minutes before adding chickpeas and broccolini. Serve with warm pita or other flat bread. paleo / no-chickpeas – replace with 1/2 head cauliflower chopped into florettes. different veg – feel free to use any veg you like, just chop into bite sized pieces before roasting. Broccoli is great and if it’s asparagus season where you live that would be my pick! nut-free – skip the cashew sauce and pinenuts and serve with hummus, goats cheese, labneh or home made mayo instead. ps. Not sure if a meal planning service will work for you? The only way to find out is to try it! You can cancel your membership at any time with one quick email. And the Easter Sale ends in less than 48 hours! Can you creat some recipes for people that are Lactose & Fructose Intolerant. That will be a great help. I pretty much avoid fructose in all my recipes. And generally provide a dairy-free variation when I use milk products so you should be able to use most recipes on the site. Thanks for asking! Hi! How much olive oil do you recommend in the cashew ricotta? I can’t find that info in the recipe. Thanks! Broccolini reminds me of my Nana’s house for Sunday dinner – with a big pile of garlic and pecorino romano. I’m trying this!